When I make beef stock, I make sure that I allow a full 48 hours for it to simmer away before I even think about canning it. Since beef bones are so thick, I want to give them plenty of time to give up all the nutrients that they have into my stock. This is what makes stock so much better for you than broth. 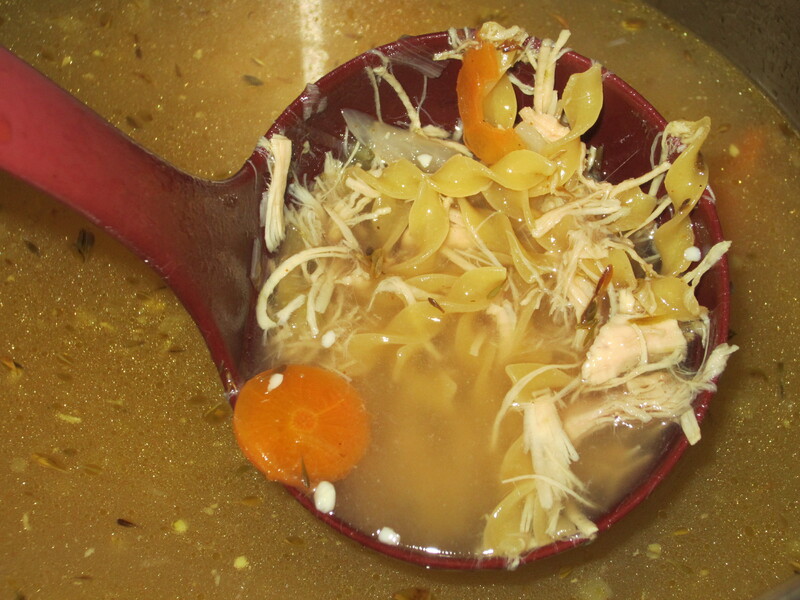 Broth has tastes good, but it is not cooked for extended periods of time, allowing whatever bones you may be using to give up all of their nutrients for you. Since it literally takes me 3 days from start to finish, I try to make a lot at one time. As for how I make my beef stock, I roast the bones in a 400* oven for about 2 hours. The roasting allows the bones to give your stock a wonderful flavor. Once they are done roasting, remove from the oven & place in your roaster. Don’t forget to also use the wonderful drippings in the bottom of your pan! They also help add to the flavor of your stock. Once it’s done simmering, remove the bones & cooked veggies. This is what you should have. 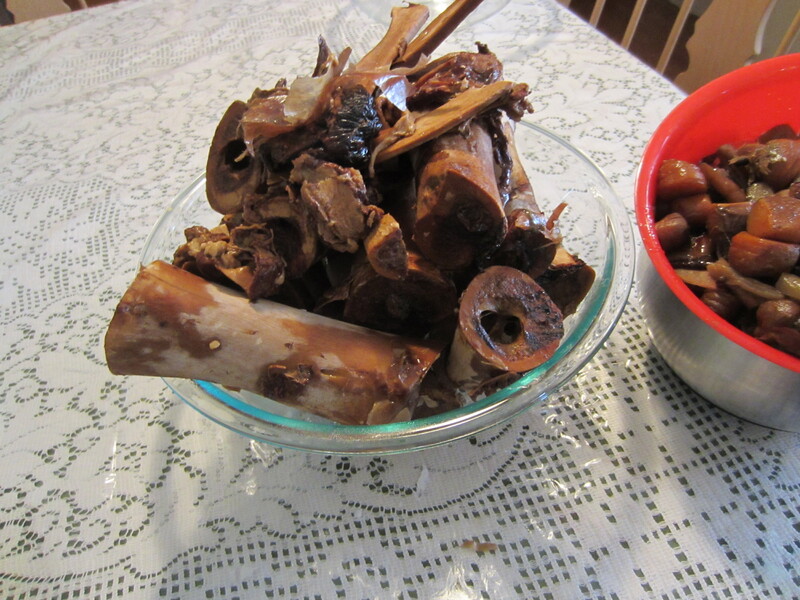 All of the marrow has been cooked out of the bones, & they have given up all the nutrients that they are going to. At this point, you can save the cooled bones for your dog (place them in the freezer until you are ready to give them to your pet). We don’t have a dog, but my sister-in-law does, so I’m saving them for her . The veggie scraps went to my chickens. They loved them! Turn the stock off & allow to cool. 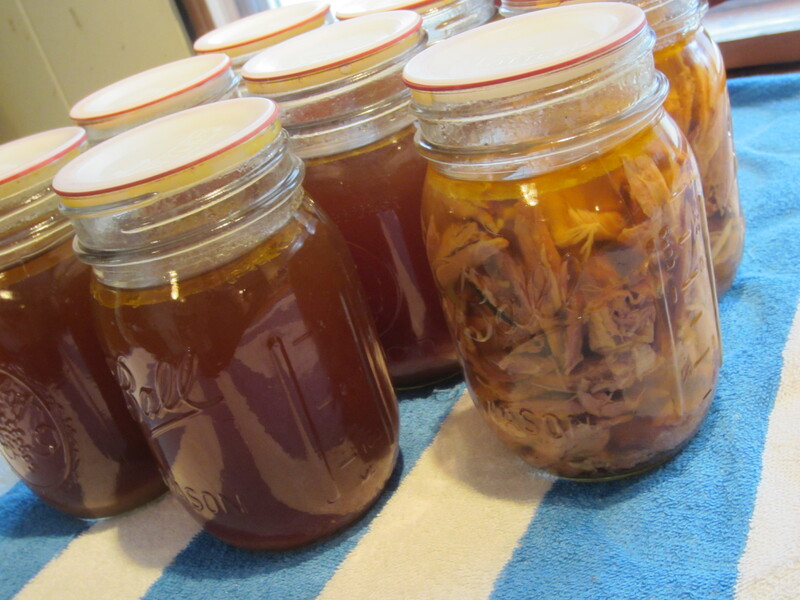 Once, cool, remove as much fat as desired from the stock before canning. I, personally, do not remove all of the fat from the stock since this is a fat that is not bad for you, and a little in moderation is okay. Measure appropriate amount of water into your pressure canner (each canner is different – consult your manual). Check all jars for any nicks/cracks before using. Reheat your stock to a low boil. Ladle hot stock into HOT jars, leaving 1-inch head space Wipe rims with a towel dipped in a hot water/vinegar mix. Place HOT seals & rims on jars, tighten according to manufacturer’s instructions. Place jars into can. Proceed with manufacturer’s instructions. Mine says to put lid on, wait for valve to pop up & allow steam to vent for 10 minutes. Place weight on & allow to come up to pressure. Once you reach 10 lbs of pressure, process for 25 minutes for quarts, 20 minutes for pints. 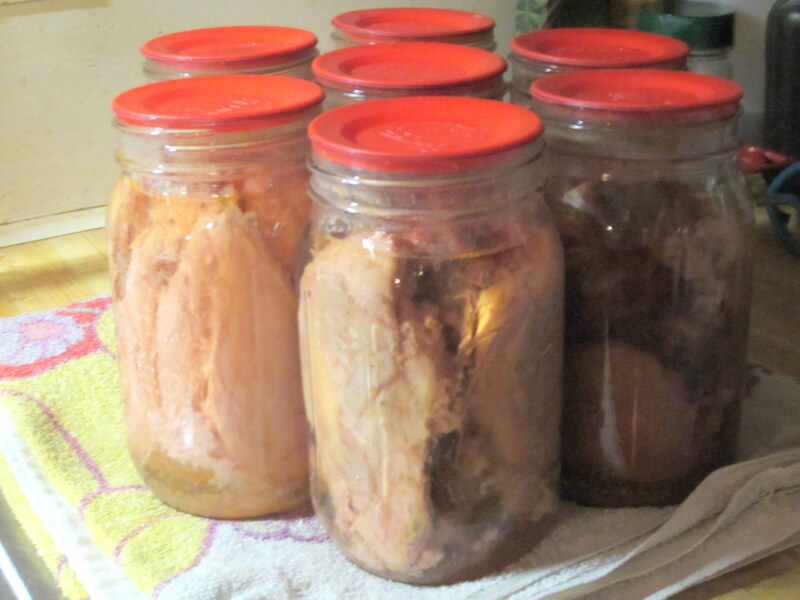 Once you have processed your jars for the appropriate amount of time, turn canner off & allow to coast down naturally. Once valve has dropped, remove weight, allow to vent for a few minutes. Always open the lid AWAY from you. There is still plenty of steam inside the canner that can burn you. 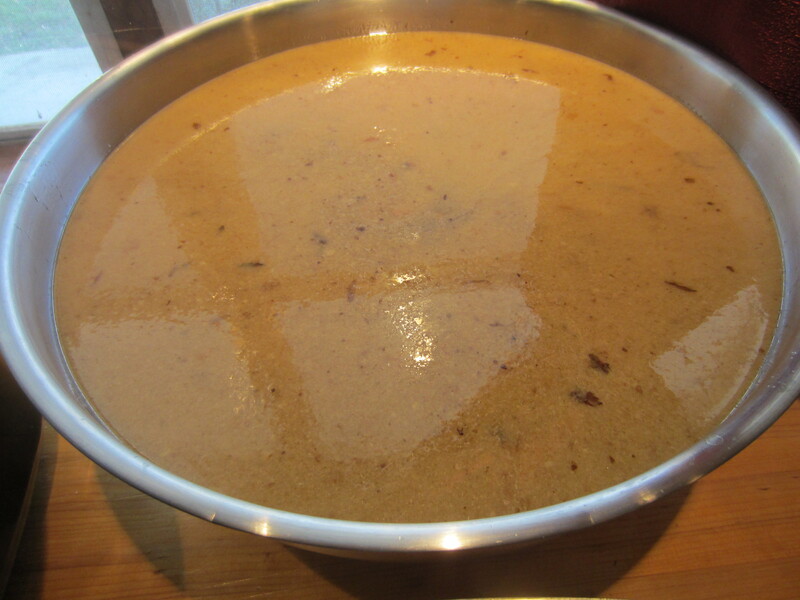 If jars are still boiling fairly rapidly, allow to sit in canner for another 5 minutes, or until the boiling stops. 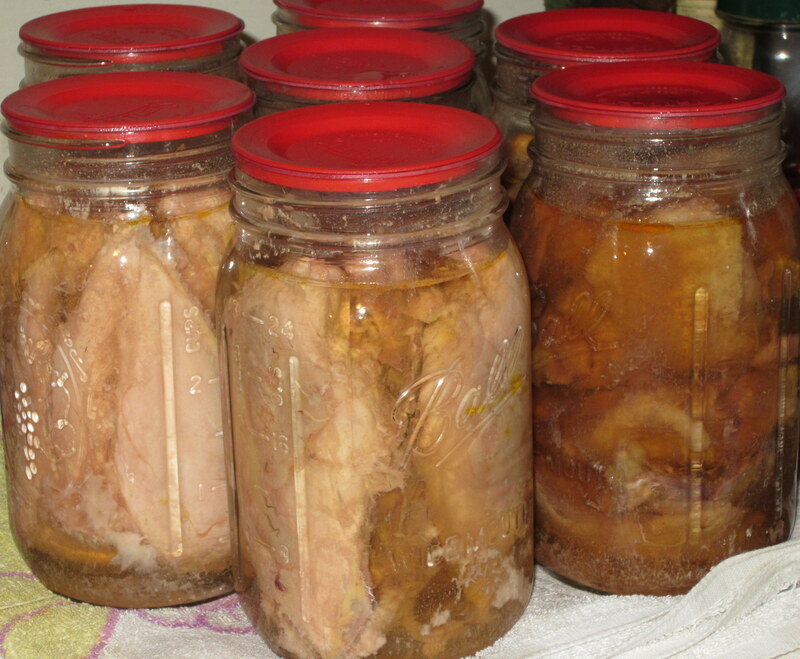 Remove jars from canner & allow to cool completely – approximtely 12 – 24 hours – before moving. I always place my jars close together on a towel to protect the surface I’m setting them on, and then I also cover them with another towel. This allows them to cool slowly & keeps any/all drafts off of them. Once cool, remove metal rims & check to make sure that each jar has sealed. If a jar has not resealed, you can either reprocess the jar or place in the refrigerator to be used in the next couple of days. 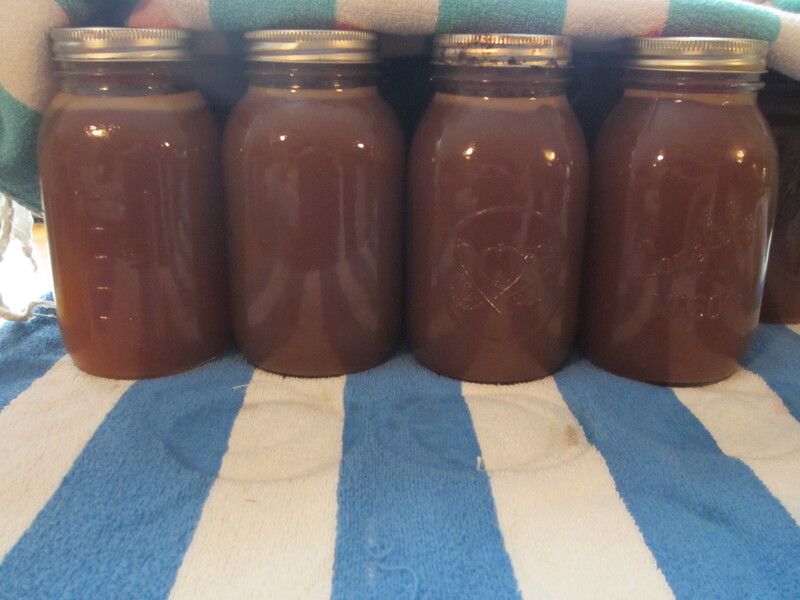 I had 2 roasters full & I ended up canning 28 quarts & 10 pints of beef stock, which will be added to my pantry. This was even after I used some of the hot stock to make dinner that day! It was delicious! Let me start off by saying that I have canned dry beans this way off and on for several years, and this is my preferred way of doing it, but it does differ from the Ball Blue Book! Please, use your own judgment! To can dry beans, I wash my jars & check for any chips on the edges. Fill jar with cool water & cover with a towel. Let soak for 12-18 hours. Drain soaking water from each jar. 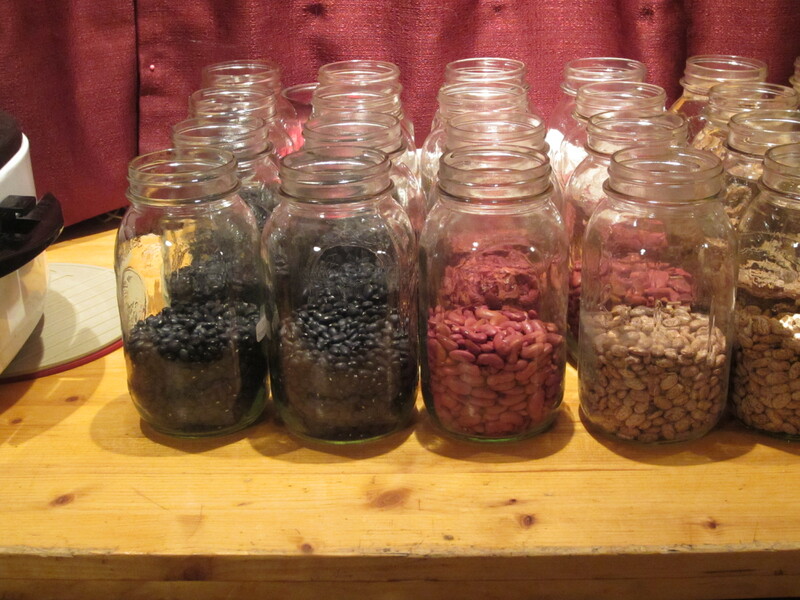 If jars are more than 2/3 of the way full, you will need to remove some of the beans from the jar. Add them to another jar. 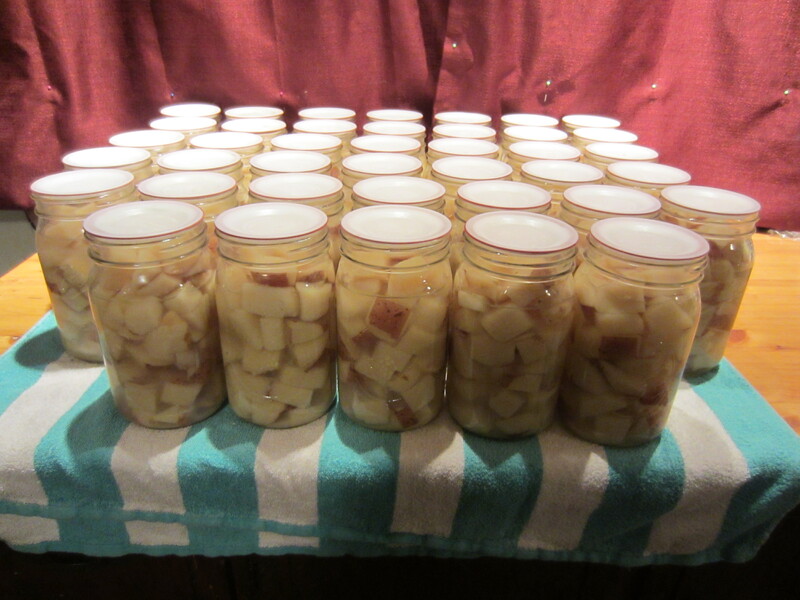 You may end up with enough to have another jar to can, or save them to cook after you’re done canning. Fill jar with boiling water. You may add salt, but it is not necessary, and I do not since it can make beans tough. Dry the lip of each jar. Place seal & band on, according to manufacturer’s directions. Can quarts of beans for 90 minutes at 10 pounds of pressure. These are great to have on hand to help get a meal on the table quickly! Enjoy! 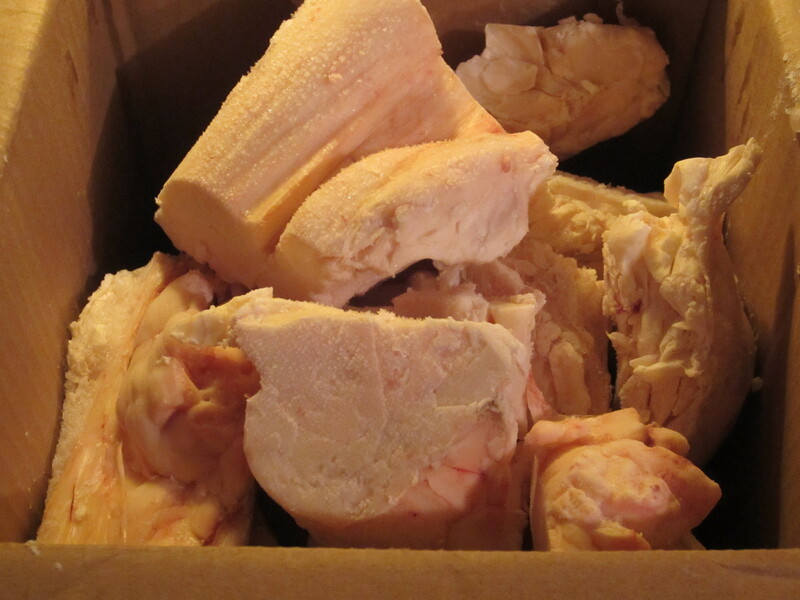 I recently put in a request for some lard/suet, and yesterday, I picked up 3 boxes full of suet (beef fat)! 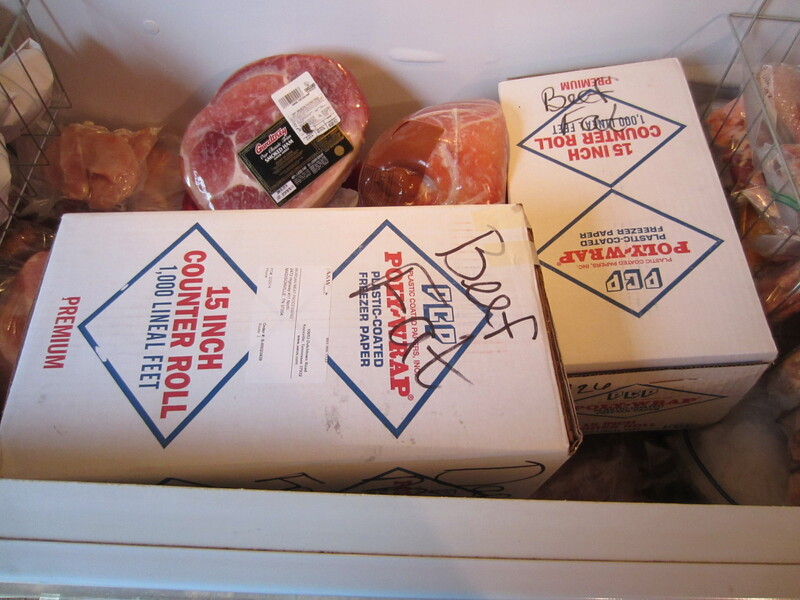 Beef fat – 2 of the 3 boxes I picked up! Here, you can see what it looks like! Isn’t it beautiful?! I can’t wait to render it down into tallow very soon. *A tip we received from his son (my sweet husband works with him) is to save some of the best suet & keep it in the freezer. When we want to make hamburgers, pull it out and & grate some over the top of of the ground beef! That is an awesome idea! This keeps the lean hamburger meat from falling apart on the grill. If you’ve ever had hamburgers fall apart while grilling them, it’s probably because they did not have enough fat in them to hold them together. Some fat is okay for you. There is no reason to cut it all out of your diet. Your body needs some healthy fats and, believe it or not, lard & tallow are good fats – just like butter! Yes, you can have too much of a good thing. Moderation is the key! Stay tuned for my new adventure into rendering tallow! Blog post coming as soon as I get a chance to get this done. 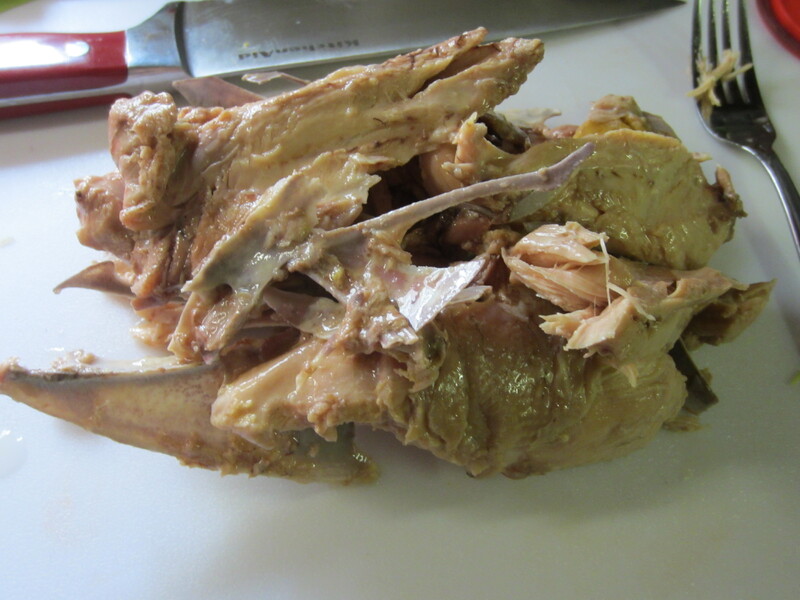 I had cooked some chicken a couple of nights ago to be used to make some BBQ chicken. Of course, I saved the stock I cooked it in. (I’m not about to waste some delicious stock!) So, yesterday evening, after I was done with my running for the day, I brought my stock back out and started heating it up to can. I also saved some of the chicken to do a trial of canning chicken. It’s something that I’ve been wanting to try, but just had not gotten around to it yet. It also gave me another chance to use some of my wonderful Tattler Lids! I love how they look, don’t you? And, knowing that they are reusable makes me very happy! And, since I had the canner going, I also added a few pints of water to make a full run. Why can water? Well, in cases of emergency, we would have sterile water to use for drinking, cooking with, brushing teeth, etc. This jars will also be rotated out. I used jars that were already empty and just waiting for canning season to go into full swing. What happens if I need those jars? Well, then I can use the water to water plants, give to the pets, drink, etc., and use the jars for my canning needs. I also used “used,” clean, seals for the water – no new seals, since it’s not food that I’m worried about keeping for at least a year. I have to admit that it looks a little odd seeing water in jars all canned up, but it’s actually very pretty, and it’s nice to know that the water in the jars is consumable in an emergency. Next up on my canning agenda……. 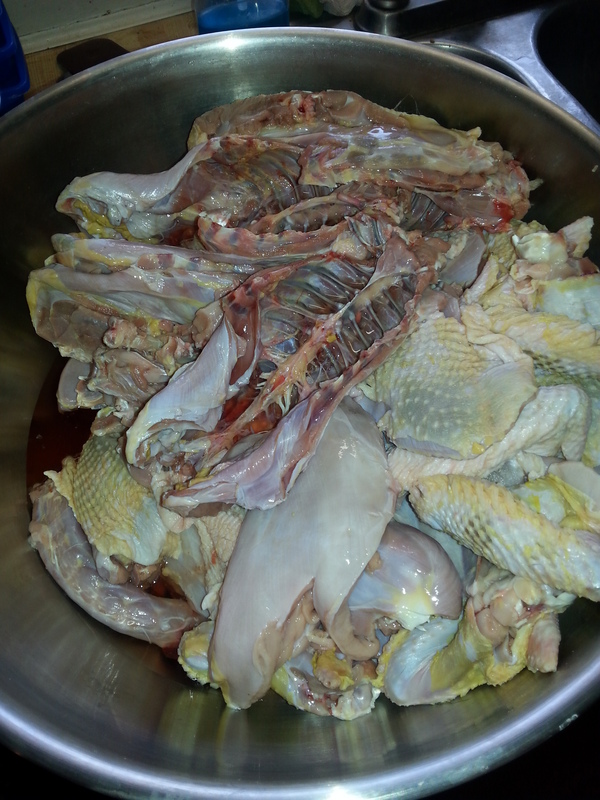 I’ve got beef bones & chicken backs/necks that I need to turn into stock. Maybe I can get started on that this weekend….. This is only the second time that I’ve been able to use Tattler Reusable Canning Lids, but I have to say that I absolutely LOVE them! And the fact that they are reusable instead of disposable is a wonderful perk. That’s about the only thing in canning that has really bugged me – the fact that the metal lids were not reusable for canning. Yes, I can use them for vacuum-sealing jars & for storing jars to keep them clean, but not for canning. So, when I contacted Tattler in the Fall of 2012 about a sample, they were happy to send me 2 dozen lids to try out, as well allowing me to offer a giveaway where they would send one lucky winner 2 dozen lids, as well! Let me tell you, I was HOOKED from the get-go! I really do love them! They work just ever so slightly different than your normal canning lids, but, if you follow their instructions, the lids work wonderfully! So, what have I been canning in January? POTATOES! There is a co-op that I order through a few times a year. In the winter time, they have 50lb bags of red potatoes for $10.75, and 50lb bags of russet potatoes for $9.75! So, I bought 1 of each and finally got the red ones canned. Out of the 50lb bag, I only had 6 potatoes that I could not use. This may have been due to the fact that I did not get them canned right away like I had planned since I had surgery on Christmas day to have my appendix removed. But, the reset were great! It took me 2 days to get them all canned, due to my schedule, but I ended up with 58 quarts of red potatoes to add to my pantry! This couldn’t come at a better time since we are down to our last quart from the last batch that I canned. What do you used canned potatoes for, you ask? Well, the biggest thing I use them for is soups, but I can also throw a quick side of butter potatoes together. I’ve also used them to make quick mashed potatoes, but they tend to be a bit pasty, so I don’t do that very often. By having these potatoes already canned, it helps me to have supper on the table in about 30 minutes. Stay tuned! I’ve got lots more canning to do in the future – grape jelly & apple jelly, beef stock & chicken stock. I may also try my hand at canning meat again. I’ve done a little bit in the past, but I’d like to do a bit more. It would be so nice to have the meat there ready & waiting to into a delicious soup/stew/casserole that I can throw together & serve in 30 minutes.